In our first eBook, Blood Glucose Levels and Diabetes Control, we discuss how several key hormones produced in the pancreas help control blood glucose levels. It’s easier to understand how this happens if you see a figure. We created one, but it’s too large to fit some eBook formats, so we’re including it here instead (see below). The pancreas is a gland that contains about a million clusters of cells, called the islets of Langerhans. The islet cells secrete hormones into the bloodstream. The figure below lists the three key cell types of the islets: alpha cells, beta cells, and delta cells. We’ll discuss these cells one at a time as you follow across the figure, from left to right. Alpha cells help raise blood glucose levels during exercise or between meals. They secrete the hormone glucagon. Glucagon travels in the bloodstream to the liver, where it acts to convert stored glycogen to glucose. The liver releases glucose into the bloodstream. Beta cells lower blood glucose levels. They do so by secreting insulin and amylin. Insulin helps glucose enter the body cells. Amylin acts in two ways. 1.) It slows stomach emptying, thus delaying glucose release into the bloodstream. 2.) It blocks glucagon secretion. Delta cells help raise or lower blood glucose levels, as needed. They do so by secreting the hormone somatostatin. 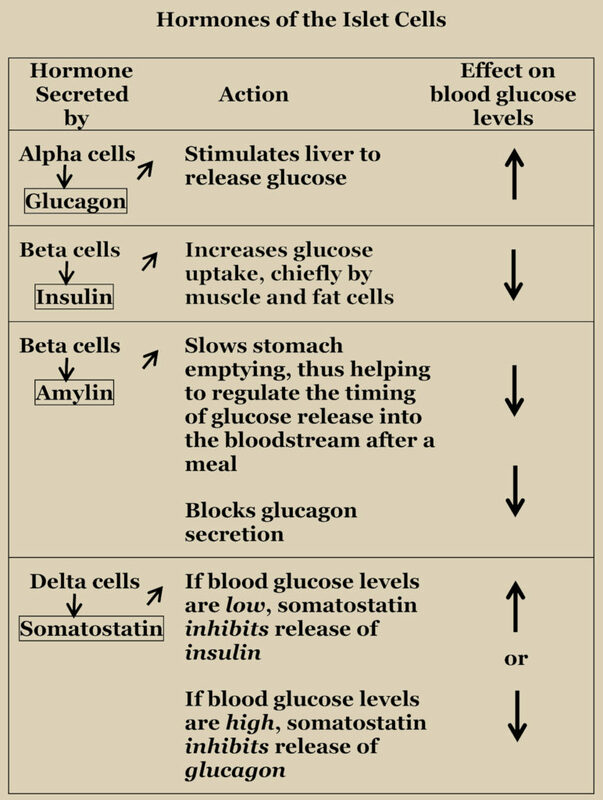 Somatostatin inhibits the release of either insulin (thus raising blood glucose levels) or glucagon (thus lowering them).